Welcome. 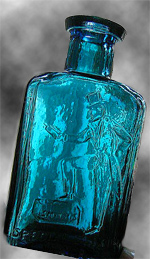 You have found the Crystal Vault's Online Guide to Crystal Elixirs and Essences. Here you will discover the benefits to your health and well-being that crystal elixirs and essences can provide. You will also find clear directions for using crystal elixirs and essences effectively. Along the way, we assure you, you will develop an understanding of how they are made while you gain an appreciation for the way they work. Crystal elixirs and essences go by many names: gem waters, gem elixirs, gem tonics, gem essences, crystal waters, crystal essences, crystal tonics, and more. However, do not be confused. Here are three easy definitions. An "essence" is just that - the essence of something. In this case, it is the vibratory essence of a single crystal imprinted in water. An "elixir" is a potion of some sort. In our usage, it is a combination of essences used for some purpose. "Gem Waters" is a just a short hand slang word. it can refer to either an essence or an elixir. So we have crystal essences - the vibratory signature of a particular crystal in a portion of water, and we have crystal elixirs - mixtures of essences used for some purpose. A crystal essence is water that carries the essential, specific energy of a donor crystal; but let's be very precise. into the auric and biophysical energy matrix of water. The energy patterns of the crystal are the results of its subtle alteration and focusing of the Universal Life Force. In the production of elixirs, water absorbs the crystal's energy pattern, potentializes it, and stores it. The patterns are manifested upon the water's interaction with a life entity. While the science of these transfers is yet to be fully understood until the science of quantum physics is matured, the efficacy of crystal essences and elixirs made from them has been accepted by cultures for thousands of years. The ancient Chinese used essences and elixirs of jade, cinnabar, and hematite for longevity. The famous text "Tan Chin Yao Ch'eh" from about 600 AD discusses the creation of elixirs from mercury, sulfur, and precious stones. The oldest Indian texts speak of elixirs. Vedic texts dating back as far as 3000 BC speak to their use. In ancient Greece and medieval Europe, powdered gemstones were used to treat a host of ailments. Even today, mineral salts, tinctures, and vitamin compounds assure modern man benefits from the Earth's bounty of healing energy found in the mineral kingdom. This Guide begins with an exploration of the subtle energies of the gems and crystals used in crystal essences and elixirs. After that discussion, we will gain a deeper appreciation for the most mundane but most magical essence on the planet - water. Next, we shall explore the processes, tools, and understanding necessary to producing effective essences. Then, with the understanding of the crystal energies, the nature of the liquid medium, and the process and variables of their making, we will explore the applications and specific uses of crystal elixirs. Uses such as tonics, adjuncts to healing regimes, bathing, Feng shui, and ritual applications will be explored in detail. Specific recommendations for potency, dosages, and applications will be provided. So read on. Our journey into the exciting world of crystal essences and elixirs is about to begin. Crystals have a structure called a lattice. It is an organization of molecules in a pattern. This pattern affects the way the crystal grows and contributes significantly to its unique abilities to absorb, focus and amplify the Universal Life Force. The vibrations at the molecular level within the lattice form resonances that reintroduce healthy stability on the biomolecular level when there is an out-of-balance energy within an organism. These molecular level vibrations can essentially imprint patterns in the auric and biomolecular fields of water which then in turn can pass on those vibratory healing patterns to another auric or biomolecular field, like that of a person, animal, or plant. The molecules of different chemicals within the crystal lattice also contribute to a crystal's ability to interact with the energies that enter the crystal. Some molecules will cause certain vibratory pathways to exist; other molecules will offer different pathways and harmonics. This is why different minerals with the same crystal lattice structure will provide different energies. Finally the resulting external shapes and colors of the crystal can alter, modify, enhance, and mutate the intrinsic energy patterns. The transmission of color information is much more direct in the use of actual crystals where the color information enters the body through the optic nerve. In the use of crystal elixirs, the color energy is more subtle and is received at a molecular level. The importance of the crystal structure, energy vibration pathways, and chemical composition of a crystal have more effect than color energy when a crystal's energy is transmitted by elixir rather than by direct crystal use. Much of the literature of crystals and most of the information on this website is focused on understanding how the unique combinations of crystal structure, chemical composition, and color affect the specific energies of a particular type of crystal. The book, "The Seven Secrets of Crystal Talismans" covers each of these elements in detail and provides extensive listings of crystal energies based on these primary attributes. For our purpose in this guide, we will accept the fact that the unique properties of the different crystals will produce unique patterns to be absorbed, potentiallized, and stored in our essences. However to capture the correct patterns and energy it is imperative to assure the crystal is natural, pure, and properly prepared. We must assure the highest quality and best possible condition of the crystal being used. Because we are seeking to capture the true, pure essence of the crystal, it is imperative that we start with a true, pure crystal. We do not want a synthetic crystal, nor do we want one that is contaminated in any way, either physically or spiritually. If you are planning to make your own essences, finding authentic, natural crystals is not difficult. There are many reputable dealers on the web. There are also many proven methods for purifying a crystal. You can find guidance in most crystal books. We have researched this extensively and published our finding in our e-book which is a fully illustrated 72 page guide to cleaning, cleansing, purifying, aligning, and dedicating crystals. All of the crystal essences and elixirs made by the EarthSong Studioes and sold by the Crystal Vaults are made from natural, pure crystals that are cleansed, activated, and charged with the energies of the Universal Life Force. And all of them are made with ature, energized, and pure water. We now turn to our next component, water. Water is a magical substance. Our earth is mostly covered by water. We humans are mostly water. And to many, water is a living entity. It is the perfect conduit for the healing and maturing energies of crystals. Water takes on the sight, smell, taste, feel, and mood of its environment. It can rage as the gusts of a hurricane lash it. It can glow in a sunset's auira. And it can serenely reflect the tranquility of an azure sky in the surface of a deep mountain lake. Water can be a conductor of emotions as in the tears of joy at a homecoming or an insulator driving everyone to isolate themselves in a shelter in a fast approaching storm. It can be a blanket of warm embrace in a spa, and a mirror reflecting a smiling child playing in a puddle. Water can be a friend when we are thirsty on a hot day, and an enemy in a flood. But through it all, water is the elixir of life - a true miracle substance to be sure. As it can absorb sights, smells, tastes, feelings, and emotions, so can water absorb the healing, cleansing, renewing, calming, invigorating, empowering energies of the Mineral Kingdom. All crystals are composed of one or more minerals which are the source of the life force for the Plant and Animal Kingdoms. Water is a part of the natural environment and has a well-known affinity for minerals. 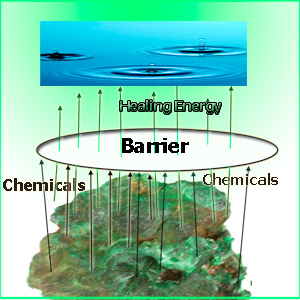 Both crystalline minerals and water are essential building blocks of our natural environment - our home - our Earth. So our second ingredient for crystal elixirs is water. But not just any water. As we have learned, water can absorb the sights, emotions, an energy of its surroundings. We do not make cleansing, healing elixirs from polluted, angry, negative, unhealthy water. We do not want chemicals in the water. We do not want other people's anger in our elixirs. We do not want negativity in any form, or from any source. We want purity - purity of origin, purity of handling, purity of intention, and purity of process. We want natural spring water from deep within the earth - Mother Nature's true elixir. We want it free of hydrocarbons found in plastic. We want it handled and processed by those with pure intentions and good hearts. We want only pure, natural water. Now there are two schools of thought here that need to be addressed. Many texts and some practitioners recommend using distilled water. We agree that the distillation process can remove the chemicals and impurities from water. We have determined that distilled water can be used successfully if it is allowed a period of calm after the distillation process. The distillation process heats the water to steam, then collects it by condensation. The use of Fire Energy in the process adds severe stress to the water biophysical energy state which requires time to calm to the point of being able to receive and store the subtle energy patterns of many crystals. Our experiments show that at least one full moon cycle of exposure to moonlight is necessary in most instances. If you are making your own elixirs, use natural spring water collected and stored in glass bottles or distilled water that has been given time to calm with moonlight. Either should work well. We use natural spring water. It is pure, it is clean, and it is not stressed by Fire Energy. Now we have our two essential elements for producing crystal elixir. We have a cleansed, aligned, charged, and pure crystal, and we have pure water. We are ready to learn how to make an elixir. There are two primary methods in use today to make crystal essences. One is the Direct Method in which the crystal is immersed in the water; and the other is the Indirect Method, in which the water is separated from the crystal by a barrier. Both of these methods are well proven. Both have many approaches and processes that are used by different providers. Let's look briefly at both of them to get some understanding of what is involved. BE EXTREMELY CAREFUL IF USING THE DIRECT METHOD, MANY, MANY CRYSTALS ARE TOXIC - PROCEED WITH GREAT CAUTION. KNOW WHAT YOU ARE DOING. The second method is Indirect Immersion. In this method, the crystal is placed on a barrier medium that is in contact with the water. The barrier medium is used to transfer the subtle energy of the crystal but prevent the transfer of potential harmful chemicals from the crystal to the water. Most crystal essences are made by this method. Many crystals contain toxic chemicals that can leach into water. 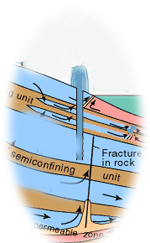 Many crystals containing lead, mercury, and copper for example, can only be safely used in essence preparation using the Indirect Immersion method. Glass and Quartz are the most common barrier mediums. Again, each designer has their own approach to the Indirect Immersion method. The same variables affect the results as affect the Direct Method. In addition, the nature, thickness, and design of the barrier medium will affect the final results obtained. All of the physical variables of time, location, duration, and crystal condition affect the quality of a crystal essence. Our experience has confirmed that in addition, the designer's intentions affect the subtle energy of the crystals and have direct effects on the efficacy of essences. In The Crystal Lotus Handbook, Margherita explains that a crystal essence cannot be made without a clear, focused intention. We agree. This is important. The necessary interaction is one of "thought-forms" projected into the internal crystal lattice and the holding of those thought-forms until they are suitably impressed in the matrix. If your intention is to design and make your own crystal essences and elixirs, we recommend you find a copy of Gem Water: How to Prepare and Use Over 130 Crystal Waters for Therapeutic Treatments by Joachim Goebel and Michael Gienger to begin. As you gain experience, find a copy of Gem Elixirs and Vibratory Healing by Gurudus (both Vol. 1 and Vol. II) These texts will lead you to a true understanding of the methods, and give you an appreciation for the effects of the variables in the process. That depth is beyond the scope of this Guide. How Do I Use a Crystal Essence or Elixir? What purpose can be served by using a crystal essence or elixir? How do I use a particular crystal essence or elixir for a specific purpose? In the following sections we will answer these two questions. 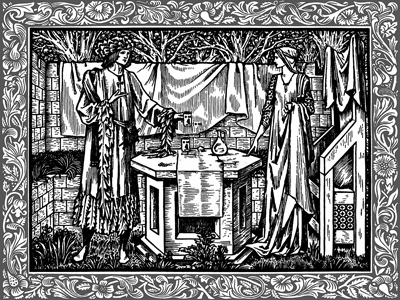 We shall start by examining the uses of crystal essences and elixirs for physical, emotional, and spiritual healing. Crystal essences and elixirs bring the healing power of a specific crystal (essence) or group of crystals (elixir) to humans, plants, or animals (living entities). The do it in a form that is easy to administer without the costs of multiple crystals - which can sometimes be expensive or impractical. For humans and animals, essences and elixirs can be administered either internally or externally. The question of which crystal essence is used for what need is not too difficult. 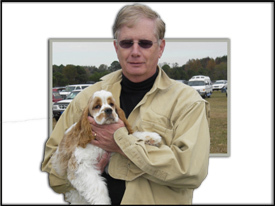 The Crystal Metaphysical Encyclodia on this websie explains the uses of crystals. The essences can be used for the same purposes as the crystals from which they are made. Each of the crystal elixirs we sell has a complete description in its listing that will tell you its uses and applications. If an essence or elixir has a unique dosage or use regime that will also be in the listing. Now be aware those suggested uses are not exhaustive. Like herbs, essences elixirs can have a wide variety of uses. The most common uses are provided, but everyone is different. Experiment if some just "seem right." You cannot do harm. For internal use, Michael Gienger tells us in Gem Waters that "when a crystal elixir is taken internally, its holistic effects are released on all levels (physical, emotional, and spiritual)." He quite aptly continues, "Getting the dosage right is the most important factor to consider when crystal elixirs are taken internally." Many of our clients have confirmed his observation that crystal essences and elixirs taken internally as prescribed can act faster and more effectively than wearing or holding a healing crystal in many cases. "It is important," says Debra at Ascended Earth that, "the person ingesting the essences should also state intent when taking them. I advise my customers to do this. For example, if a person is taking Ametrine to open their Third Eye and higher chakras, before taking the drops, they can state their intent by saying something verbally or in their head like, 'My Third Eye is open now, and so it is.' The energy of this intent, stated in the present tense, is then imprinted on the dosage and the desired outcome is manifested more quickly. It has been proven by Masaru Emoto that water can change shape due to certain verbal vibrations. The essences work the same way; they are imprintable. By the person taking the essences becoming an active participant in their own healing via intent, healing processes are magnified." Our research suggests following certain guidelines for internal consumption of crystal essences and elixirs as a part of a healing regime. For use as a tonic, we differentiate three categories of crystals: High Energy Crystals, Normal Energy Crystals, and Calming Crystals. These categories are based on the intensity of the crystals' natural vibrations and the effects of the vibrations on living organisms. In general you will find that warm colored crystals have a higher vibratory state than cooler colored ones. While we try to assure every essence is clearly described to include its intensity rating, if you are unsure, the closer to the red end of the color spectrum, the higher the intensity. The closer to the violet end, the lower its intensity. This is a general rule. Vibrancy of color, chemical composition, and the external structure of a particular crystal can affect its vibratory intensity. Please check our individual crystal essence listings for details. Essences and elixirs can be ingested in primarily two ways. It is a personal choice. Many makers recommend that the prescribed number of drops be taken directly under the tongue. This puts the essence in the body sublingually, so it is immediately absorbed, and does not go through the digestive tract. Many practitioners feel the effects are more powerful and beneficial this way. The second way is to mix the essence or elixir in a small amount of water. In the table below we suggest that generally about 4 drops is a dose. Putting those drops in 8 ox of water is a good rule of thumb. High Energy Crystals: For extended use, take a 7-day break every two weeks. Normal Energy Crystals: For extended use take a 7-day rest between each 30 days. Calming Crystals: Not for extended use. Limit to every other day. Important Note: While we have found no books or other guides discussing the temperature of the essence or elixir, we have found that if the essence or elixir is taken directly under the tongue, then the elixir can be room temperature. However, if you are going to mix the essence or elixir in water, we believe the essence or elixir and the water in which it is diluted should be very cold if you are not going to drink it immediately. 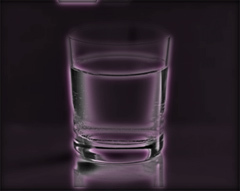 You want the crystal energy to be released inside the digestive tract as the liquid warms, not in the drinking water where it can, over time, dissipate or become affected by other energies if not immediately consumed. Dogs, cats and other pets can safely be treated with crystal essences and elixirs. They can benefit from the powerful healing energies as much as humans can. The dosages should vary with the size of the pet. Since you cannot control how much water a pet drinks you should mix the essence or elixir in a container and fill the animal's water dish from the prepared container. We suggest mixing 1-2 drops to a cup of water to start. Adjust the proportion as necessary up to a maximum of 8 -10 drops to a cup over a 3-4 week period. Should that provide little effect, then the animal is not receptive to that particular crystal energy and a different essencd or lixir should be used. Auric imbalances and life energy flow blockages are often treated with crystals. As an adjunct to crystal healing, crystal essencdes and elixirs have been shown to significantly enhance many therapies. As a general rule, an essence or elixir is often used to infuse the energy of a complementary energy into a healing crystal. For example if a patient is being treated for despondency with a brightening energy crystal, that crystal might be placed in a diluted mixture of a serenity energy elixir to refine the subtle energies of the crystal. In other words use elixirs to make subtle additions to a crystal's energy to "fine tune" it for a particular need. In addition crystal essences and elixirs can be applied externally to the body to target certain imbalances and diseases. The energy patterns will be transferred from the essence or elixir to the skin and into the body. This is a good regime for chakra balancing in particular. For most applications the mixture should be stronger than the mixture for internal use. Use the following table. Calming Crystals 10 drops per tablespoon Single application as needed, limit to occasional use. Administering crystal elixirs externally can be done easily using a small spray bottle. This allows for excellent control over the dosage, ease of application, and the ability to both target a small area or to treat a large area. In summary, crystal essences and elixirs are a well researched and effective method of gaining the real benefits of crystal therapy. They are easily used, come with clear instructions and are safe for people and pets. Dosages are easy to control, and the essences and elixirs have good shelf lives. You will find you can gain the benefits of crystal therapy easily, and often at less expense using essences and elixirs. You will also find that you can easily help others with elixirs even without the training that many crystal healing regimes require. Dosages and frequency of use for external use of crystal elixirs on pets are relatively easy to determine. For virtually all applications use the same dosages as for human use. A spray bottle should be used to allow for a fine mist to be applied. Do not overspray. An animal's coat should not be wet. A quick spritz from a distance of about 6 -10 inches on each side of an animal is sufficient. Animals seem to respond with more sensitivity to most elixirs, so a reduced amount can be used. Crystal essences and elixirs can help deal with growth and flowing issues on both food and ornamental plants. For individual use, a spray of a mixture of 1 - 2 drops per tablespoon twice a day should be sufficient. Usually only High Energy crystal essences or elixirs made specifically for plants are used. Essences and elixirs can also be administered to plants during watering. Because the roots are more receptive, a very diluted mixture will be effective for most applications. We suggest 1 drop to 40 ml for maintenance up to 2 - 3 drops per 40 ml for dealing with stress from disease, environment, or pests. You do not need to have physical, emotional, or spiritual issues to benefit from the energies of crystals potentialized in an elixir. Many essences and elixirs are excellent for use to maintain a healthy balance and free flow of Life Energy. We learn more each day about the need for maintaining good health. Periodic use of crystal elixirs can be a great adjunct to regular exercise, good spirits, and good nutrition. As Randell and Vicki Baer taught in their 1984 seminal work "Windows of Light," "drinking crystal water on a regular basis will gradually increase the vibrational quality of every cell... and as a result the entire auric system is vibrationally upgraded." We have studied this use. Every elixir listing discusses the uses of a particular elixir as a tonic. Each listing prescribes an appropriate dosage. In general you will find that Normal Energy crystals are best suited for crystal elixir tonics. High energy ones are certainly suitable as occasional "pick-me-ups." The Calming crystals are also useful for the occasional "I need a rest" use. But for long-term maintenance of a healthy energy flow, the Normal Energy crystals are most suitable. The most effective regime is one of regular use. It allows for the subtle energies to be constantly refreshed. Most users have experimented and come to find that once or twice daily use is the optimum schedule. The potion amount seems to be of less importance than the regularity of the use. So pick a time that is convenient, and try to be regular in your habit. The mixtures for crystal essence and elixir tonics are more diluted than for healing uses. In general most crystal elixir tonics are a mixture of 1-2 drops per 8 oz. For some crystals, dosages half that ratio have had good effects. Again, each listing will provide details of an elixir's use as a tonic. Crystal essences and elixirs can be added to bath water when used as either a part of a crystal healing regime or as a tonic to preserve vibrant health. Bathing in water that contains the focused energy of a crystal or combination of crystals can be an excellent method to infuse your body with the Life Force that keeps our bodies and spirits alive and healthy. To use a crystal essence or elixir in a bath, only a small amount of elixir is needed. The complete immersion of the body in the water for a relatively long exposure allows for a very diluted mixture to be effective. We suggest that for High Energy crystal essences using 3-4 drops to a normal tub of water should be sufficient for a 10-20 minute bath. Adjust for longer or shorter times. For Normal Energy crystals, 6 - 8 drops per tub should be adequate for the same 10-20 minute bath. The use of soothing Calming Energy crystals is particularly recommended for bathing. 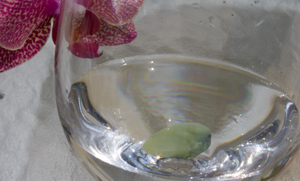 Calming crystal energies when infused in warm bath water in an appropriately soothing setting can bring lasting relief to a host of physical, emotional, and spiritual ailments. Similar in effects to several herbal and flower essences, the soothing energy crystal elixirs can amplify the calming and relaxing experience. These elixirs can be even further diluted than the others. Because relaxation baths are usually longer in duration, and generally have less physical movement, the water has more time in contact with the body. We find that only 1 - 2 drops are really needed. And at such a diluted mixture, there is no restriction on frequency of use. 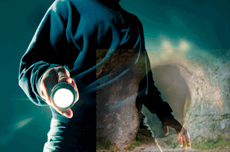 Have you ever entered a room where you get the impression there is fear, fright, anger, discord, or injury in the air? Have you entered spaces that just make you sad, fearful, uncomfortable, out of sorts, clammy, despondent, or on edge? Sometimes places can retain the negative energy of human discord long after events have occurred. Such an environment can be injurious to your physical, emotional, and spiritual health. While treating the area with the appropriate crystal is always an option, crystal elixirs are also an excellent remedy. For clearing spaces of negativity, elixirs should be administered with spray bottles. There are three primary methods that are proven effective. The first method is the "Circuit." To perform a Circuit, mix an elixir according to the instructions in its listing, or if none are provided, mix 4 drops to 20 ml water. Use High Energy crystal essences or specially formulated elixirs. Put the mixture in a spray bottle and go to a point just inside the entrance and face the wall to the right. Standing in that location be very firm in your intention, announce in very stern tones exactly what you want changed and spray the area, high and low, every few feet moving around the room back to the entrance. Open all doors and windows if possible. Allow the negativity an escape route. Depending on the size of the space and the degree of negativity, one or two repetitions may be needed. The second method is the "Expanding Circle," also called the "Spiral." Start the area of the space in which you feel the most negativity. 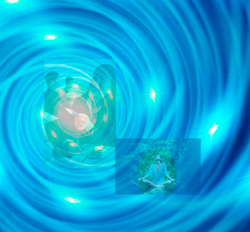 Slowly walk in an expanding circle spraying the air every few seconds repeating your intention with each spray. This is a more potent clearing method if a focus of negativity is in a space. As in the Circuit, open doors and windows, if possible. Repetitions are usually not needed. You may well need more elixir for this method for larger spaces. The third method is the "Elixir Smudge." This is for outdoor or very well ventilated areas. Get a White Sage smudge bundle and abalone shell. Light the sage and place in the shell. Spray the crystal elixir into the rising smoke to infuse it with the crystal energy. Announce your intention with each spray. Depending on the size of the space, a full 20mm dosage should be sufficient for most uses. Adjust time and dosage as necessary. Negativity takes its toll on one's spirit and eventually on one's physical health. Do not live in an environment of negative energy. Either remove it or remove yourself from the space. 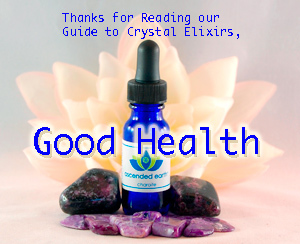 Crystal elixirs can be a great benefit to a healthy life if used to clear negative energy from your environment. Crystals and Crystal Essences and Elixirs are very useful in providing for the free flow of t he Universal Life Force in a space. While good design and careful placement of structures is paramount, there are times and situations that need other tools. The free flow of natural, life nurturing energy within a dwelling, workspace, or room is essential to the health and well-being of the occupants. 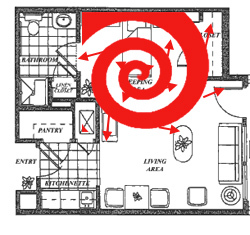 The teachings of the various schools of Feng Shui provide a solid foundation for assuring the flow of this energy. 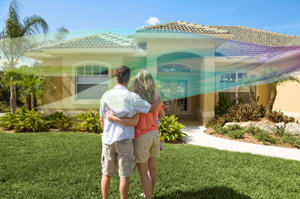 They also provide extensive guidance for assuring we are living in harmony with our environment. Crystal essences and elixirs can be powerful tools in the practice of Feng Shui. Sometimes, even with the best efforts to design and integrate a space with the environment, problem areas develop. 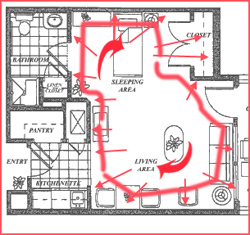 You may find pockets of staleness, corners of lethargy, or cubbyholes of foreboding. These can be dealt with with flowers, water, crystals, or other tools. If a crystal seems to be needed,but the right one is too expensive or just won't fit the space, an elixir will work well. It will bring the energy pattern of the crystal to the space. As in the section on removing energy, using elixirs for Feng Shui is best accomplished with a spray bottle. For most uses, mix 4 - 6 drops to 20 ml water. Spray the area early in the morning each day. For small areas, four or five pumps of spray will suffice for a day. Normal Energy crystal elixirs work best, and are recommended. Little has been written about the use of crystal essences and elixirs in clearing, blessing, preparing, and using altars for devotional uses. Whatever entity an altar is devoted to, the essence of an appropriate crystal can be used to bring the focused Universal Life Force to the devotion. Sometimes the crystals needed are either not available or just very expensive. Sometimes you will need combinations of crystal energy that call for rare crystals. In these cases the economy of crystal elixirs can offer the essences needed. Keeping a variety of elixirs on hand will provide the flexibility to decorate and use the altar for many specific rituals. The section of this website devoted to Crystals of the Goddesses, for example, offers guidance on the crystals appropriate for devotions to about a hundred goddesses. Should you not have a particular crystal, a crystal elixir can be used effectively, too. The section of this website devoted to Angelic Crystals and Guardian Angel Crystals provide references to the colors of crystals to be used in facilitating communication with Angels. Using the elixir of a crystal of the preferred color will work well on an altar. To use any crystal elixir on an altar, mix 4 drops in 20 ml water. You can either use an eye dropper to apply the elixir to locations in which a crystal would be used, or a spray bottle to put the crystal essence over a larger portion of the altar. If you have a particular arrangement of crystals and their energies in mind, use the eye dropper. If you are just seeking the focusing of the crystal's energy, the spray will work best. This guide is not meant to be all-inclusive. It is an introduction to the uses of crystal essences and lixirse. It is not the destination; it is a launch point. Use what you learn here as the basis for your journey of exploration. Whatever name you use, crystal elixirs can be a wonderful way to bring the magic and wonder of crystal energy into your life. They can be an important element in vibratory healing, serve as tonics to preserve health, clear negativity and maintain a healthy flow of the Universal Life Force where you live and work. They can provide the energies needed in devotions and ceremonies when appropriate crystals are not available. Feel free to modify and experiment with the recommendations of this guide. Remember - it is only a guide. You must find your own path in life, and you must find your own path in the use of Crystal Elixirs. We wish you good health. Enjoy!